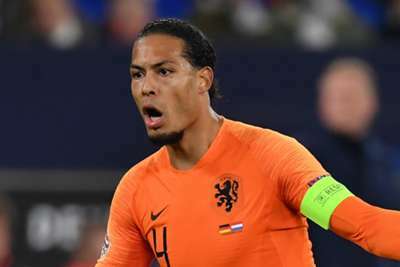 Virgil van Dijk said Netherlands' clash with Germany in the European Championship qualifiers will be "a special game" and targeted a repeat of the 3-0 Nations League triumph his side enjoyed in October. The Liverpool defender opened the scoring at the Johan Cruijff ArenA when Ronald Koeman's men brushed Germany aside, Memphis Depay and Georginio Wijnaldum adding late goals in a comfortable victory. Looking ahead to Sunday's clash, Van Dijk told reporters: "It's a special game with lots of history. It's always got that extra thing, that's what everybody should feel. "I do feel that myself. We're now in a period where points do matter a lot. Tomorrow will be a special game. "I think you always need to prepare well when playing for your national team or your club. But this time you need to do that. I'm not worried about that at all, I'm sure all my players will be well-prepared." Netherlands have lost just one of their last 10 matches in a year-long sequence marked by continuous improvement, culminating in Thursday's 4-0 victory over Belarus. Van Dijk was on target yet again in that game, but he said scoring would be a bonus as he set his sights on a positive result against Joachim Low's side. "I think we can get a good result, and a goal by me would be a bonus," he said. "We play to win. We were pretty lucky last time we faced them [Germany]. We scored the equaliser in the dying seconds, then you're going crazy of course. "It was a difficult game because they moved around a lot, lots of positional changes. They scored in the right moments, that's something you got to learn from. "As a team we need to play more compact and more disciplined. I think we've learned from that."